There were two groups of people, red and white, standing in the area that has been isolated with plastic thread shaping a rectangular around it. Then I looked a little bit lower and I saw one thick, big and long bamboo just right next to their feet. One group was standing at one end and another was at the other end. There were five people in each group, discussing who should stand in front, the second and so on. Meanwhile I saw another unknown man that was not belong to anyone of them asking them to lift up the bamboo and hold it. That man then placed his hand right in the middle of the bamboo, looked at each group and started to count. I was still trying to look for a spot so I could see clearly what they were trying to do but before I got it, I already heard some cheers from the people around! I saw those two groups holding the bamboo tightly and trying hard to move forward pushing the bamboo towards the other group and likewise. That was quite intense. I imagined if one of the team member loosen himself for just a split second then the team might have lost the game. “Are they playing pulling rope (tarik tambang)?” one girl who just came from behind asked me. “I think…no. They seems to push the bamboo,” I answered. “Ooo…” Then I continued to watch the game which lasted not more than fifteen minutes to get the winner. Dagongan, one of the sport games I saw last week at the 6th TAFISA Games 2016 event. At first I thought the game is invented somewhere else but actually it came from Indonesia. This is one of the aims of TAFISA, The Association For International Sport for All, which is to promote and develop traditional sports and games. 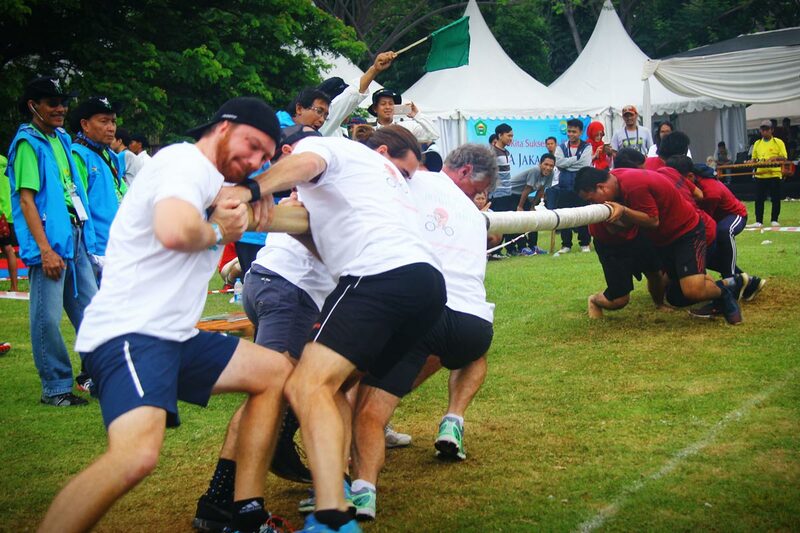 This year the event is held in Jakarta from 6-12 October, happening simultaneously at few places – from Jakarta to thousand islands across the capital. with 9000 over participants coming from more than 80 countries participating in the event. All delegates came to showcase the sports and games from their own country and visitors may try them at no cost. It’s a fun-packed event for all. It was last Saturday when me and few other travel blogger fellas were invited by the event committee (on behalf of Ministry of Education and Sports) to explore Ancol, the main venue of TAFISA Games 2016. Despite of its 6th year, it was still not so familiar yet for many of us. I didn’t know what to expect but since it has something to do with sports and games, I was still pretty sure it’s going to be fun. Once we got our passes from Mr. Fajar, one of the committee that patiently waiting for our coming at the west entrance of Ancol, we went in and right away headed to Lagoon by taking the provided bus within the park. And it was beyond my expectation to see the crowds by the beach, playing any sort of games that I have never seen for quite some times. 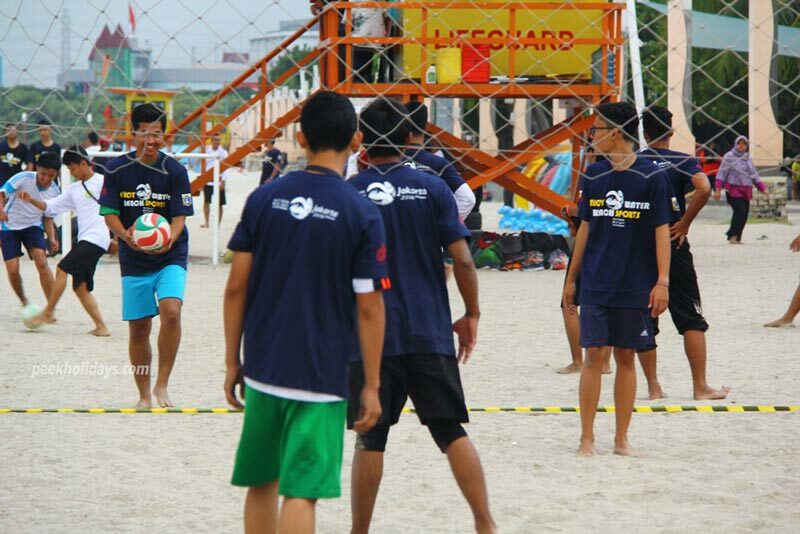 Such as beach volleyball, anyone? Further away from the beach, we could find a traditional game from French that is similar to Pétanque, which is also popular in China. It is not as easy as it looks as in just to throw and toss the other ball in front of us. The fact, our Minister of Education and Sports, Mr. Imam Nahrawi, took the chance to try out the game and only succeed after few trials. When was the last time we play this game? This question popped in my mind as I walked along the venue at the Eco Park. In here, I found one of my memorable childhood games. Engklek, that’s how we called it in Indonesia. I just knew that there are few versions of this game, depending on the country. Those times when we called up our friends staying next door to gather and play together after school. One of us will start looking for a stick and draw the box as big or as small as we want on the empty ground near to our house. We would be taking turn to jump from one box to another with one leg till the end, a simple game that bring joy to all of us. Sometimes we would lost our balance and we fell. But we laughed and played again after that. Then we would went home with sweat and dirt on our forehead or dirt on our clothes and our Mom would then shout on us to dry up and take shower after that. Then, we would repeat again the next day because simply it was fun! Now, as we grow up, we leave all those childhood games. But, when was the last time did we see kids playing this game? I myself couldn’t recall. Near to that Engklek, we saw a row of benches with built-in board games from many countries in the middle. Some looks familiar, some I have never seen before. Despite of it, all looked interesting and made me guess how to play the game. For me, all these board games are brainy. Need strategy to win. But again, when was the last time we play game like this? I think one day if I have my own house, I don’t mind to have one of those bench in my living hall. Moving forward from that board games, we reached a pretty big park where we could see traditional dance performances and games from various part of Indonesia and also other countries. I gave up at this stage, a lot of the games here I have never seen before. Mostly the equipment of the game are made from either bamboo or wooden material and to play the game, it requires us to move around. I was comparing to games that most of the kids play nowadays, obviously not the same. To complete the whole sport games experience, besides recreation sport games, there was also e-sport competition. Remember those day when Counter-Strike game strikes in? That was probably the most happening e-games during that time and in this event, TAFISA bring back all those good memories by including e-sport as part of the programme. Not only Counter-Strike, there were other games as well. I was amazed entering the e-sport hall game with that main big screen in front, we were getting real here! There were many other programmes such as World Arm Wrestling Champioship, International Street Soccer Tournament, International Orienteering Competition, International Wall Climbing Competition, World Dragon & Lion Dance Championship, and many more. I wish I could split myself into few “me” so I can check out other programmes at other venues as well. For more information, please visit TAFISA Games 2016 official website. Nevertheless, it was definitely an interesting event to go and I am grateful that I was there to record some part of the event. Remember to move more and sit less. Now I am wondering, where will the event be next year? Next articleVasanti Kuta Hotel: Have You Heard About It?